One word. So simple. So powerful. Oh, how my life has changed. It's time my writing did as well. On December 19th, 2012, on the birthday of his great-grandfather, my son, Jacob David was born. The joy motherhood has brought me is deeper, and more primal than I could ever have imagined. It's been well over a year since I last wrote. My life, my work, and my family lifted me up and carried me away. I don't regret it, and I make no excuses for it. It's important to walk away, gain perspective, and figure out why you write. There are so many stories, feelings, and words taking over my brain these days, I need to share them again. My passion is still local food. 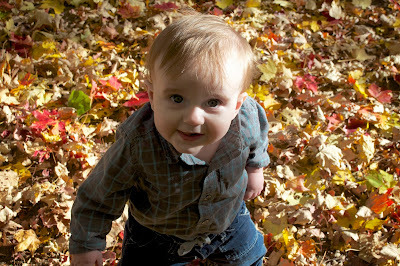 New England has my heart, and I cannot wait to introduce this precious little boy to all of it. However, I feel like just focusing on local food puts me into a box. What about family recipes that have my heart, full of stories and emotion? What about all the emotions and thought I have on family? It all deserves a place. From this point forth - the blog will change. I have a lot of thoughts running around my brain. There will still be food and recipes. For me, every life moment is marked by some kind of food. I thought of overhauling everything, name, look, all that stuff. Let's be honest here, I don't have time for that right now. I just want to share and write. So it begins. The posts and recipes from Lighter and Local will stay right here, and I'll still share recipes of local flavor and flair, but the box doesn't fit anymore. Or more correctly, I don't fit the box. I'm hoping you will continue with me on a new journey, one filled with food, family, and adventures. My adventure is just beginning. My baby is on the brink of being a toddler. 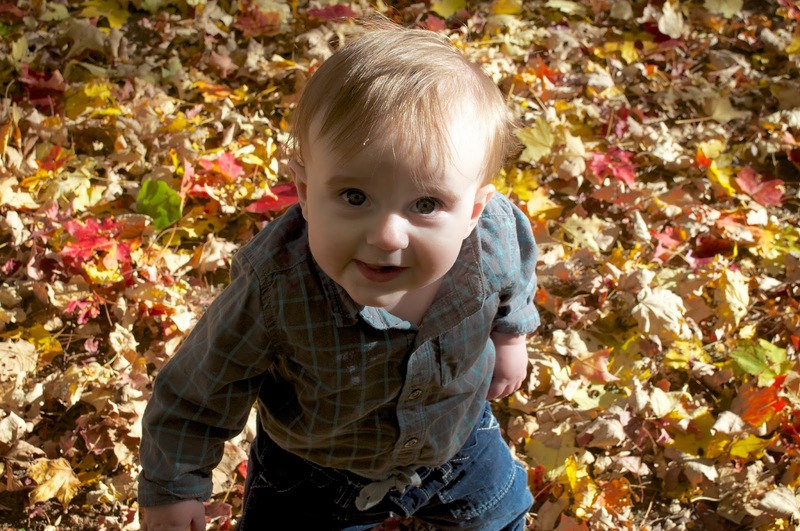 He's 11-months-old, he's walking, and a force to be reckoned with, just like his mama. I'll begin with a family recipe, tucked into a box, written in my Nana's own script. It's fitting to kick this off with a recipe both she and my own mother, treasure. I hope Jake will stand beside me, his hands covered in flour, helping me make them one day. I can't wait. Cream butter and add flour, sugar, and mix. Press mixture down in pan (ungreased) and bake for 20 minutes or until golden brown, checking every 10 minutes. Spread topping on hot baked crust. Bake at 350 degrees for about 30-35 minutes or until set. Sprinkle with confectioner's sugar, allow to cool completely, and cut into bars. Oh wow. It's been over a month again. 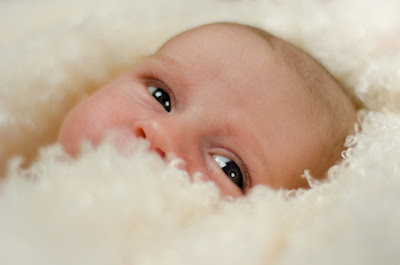 I'm back with a painfully obvious, yet cute, yet completely cliched post. There are a lot of reasons I haven't been able to keep up with my cooking, baking, writing, my therapy. I took over a new and challenging position at the paying job, and finding balance hasn't been easy. I was disenfranchised with food blogging in general and uninspired. However, there was a larger reason for the lack of noise here over the past five months or so. I'm happy to tell you all that the husband and are expecting our first child! Baby Bingham is due December 15th 2012, the best Christmas present for which one could ask. Now, unlike his/her mother, Little Baby Monkey (as baby is affectionately known, since we are not finding out if it's a boy or girl), hasn't loved food all that much. I haven't been sick, but my list of food aversions has been quite long. For almost the entirety of this pregnancy, it's been a struggle to eat pretty much anything else other than cake. Fear not, I haven't been living on cake alone. Therefore, I've been frustrated. This food-loving lady just hasn't been able to cook or bake much. The effort put in, to not enjoy it at the end, well, I couldn't take it. Thankfully, now in Week 22, food is a ray of sunshine again. 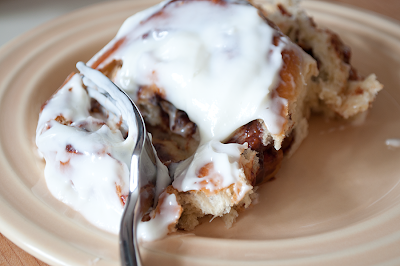 This Saturday morning, I sit with Grateful Dead radio playing, waiting for the dough for these cinnamon-peach buns to rise, thinking about all of the things about eating and food that I cannot wait to teach my little one. 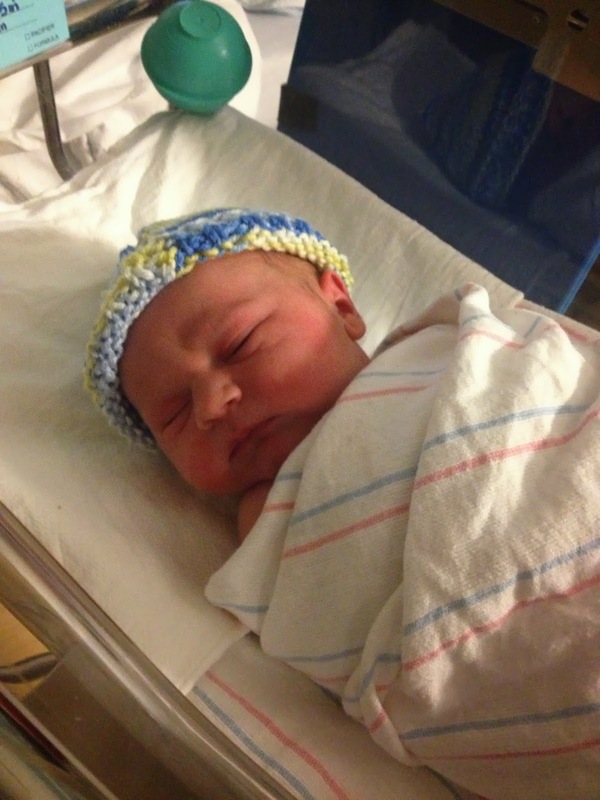 I cannot wait to teach you the love and care that goes from farm to table. I cannot wait to share your first, juicy, June strawberry with you. I cannot wait until you pick your first tomato out of our backyard garden with your father, who tends to it carefully and lovingly. I cannot wait to teach you how a July blueberry is heads and tails above a shipped-in blueberry at the grocery store in January. I cannot wait to take out the box of my grandmother's recipes with your grandmother and cook and bake through the past with you. I cannot wait to travel with you and introduce you to foods and cuisine all over this amazing food. I cannot wait to sit at the kitchen table with you and your daddy on a Sunday night, and share a family dinner, and talk about everything under the sun. I cannot wait to share with you the love, toil, and reward that goes into the growing and preparing of what we eat, I want you to treasure it as much as I do. The husband and I are so thrilled to become parents and share this world with our child. I'm nothing if not honest, it's as terrifying as it is thrilling. However, I'm standing at the edge of the "long, strange trip" parenting is known to be. I cannot wait to jump. Note - this is not a quick weekend morning affair. It takes two hour-plus rises. The time you put into this recipe will be 100% worth it, I promise. After this, no commercial cinnamon bun or roll will ever seem the same. They're that good. 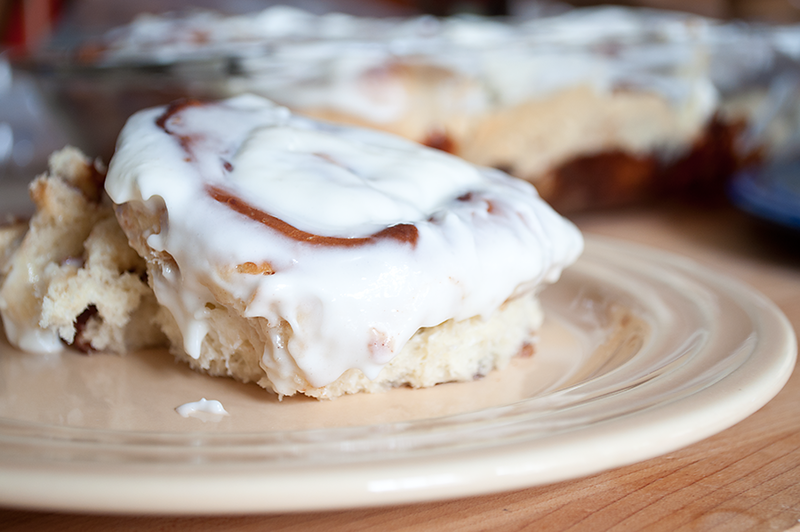 The icing DOES use corn syrup, you could probably omit and add a touch more cream, a touch more sugar. I do not mind using it on occasion. You know me, everything in moderation. 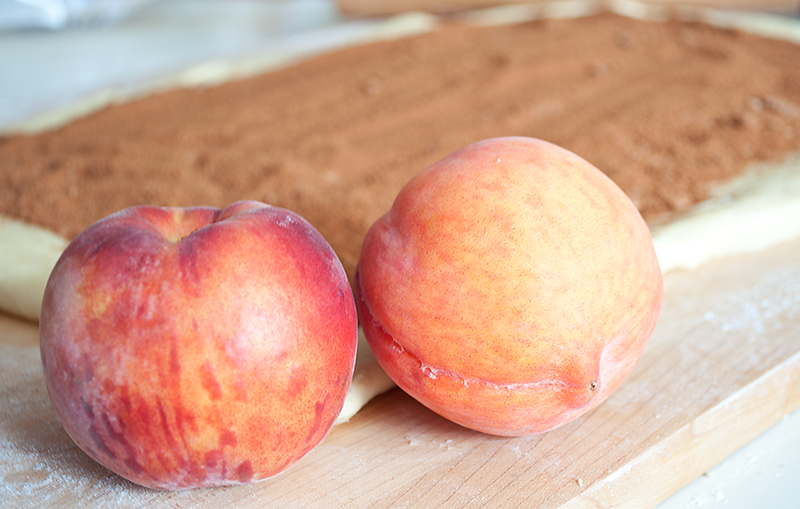 Do this with peaches (perfect right now) or blueberries, or apples, whatever, it's all wonderful. Dough: Heat milk and butter in a small saucepan over medium heat until combined. Remove from heat, set aside, and allow to cool a moment to 100 degrees. Using a standing mixer with the paddle attachment and its bowl, combine water, yeast, sugar, egg, and yolks at low speed until mixed. Now add your salt, warm milk mixture, and 2 cups of the flour. Mix at medium speed until blended. This will take about a minute. Now, switch to your dough hook attachment, add the other 2 cups of flour, and knead at medium speed (adding more flour IF necessary) until the dough becomes smooth and clears the sides of the bowl. This takes about 10 minutes. Scrape your dough onto a a floured work surface, shape into a round, and place into a lightly-oiled bowl. Cover said bowl with plastic wrap, and leave in a warm, draft-free spot to rise until it doubles in bulk. This will take 1 1/2 to 2 hours. Icing: While your rise is taking place, tackle the icing. All you have to do is combing all icing ingredients together in the bowl of your stand mixer (or in a large bowl to tackle with a hand mixer) and beat until all the lumps are out and everything is well combined. Transfer to a bowl for storage in the refrigerator until you need it. Rolling/Filling Dough: After your dough round has doubled in size, transfer it to a lightly-floured work surface. Roll it out to a 16x12-inch rectangle, with the long side facing you. Mix together all of your filling ingredients in a bowl, and then cover your dough, leaving a 1/2-inch border all the way around. Starting with the edge closest to you, roll your dough, pinching along the way to make sure you're getting a nice-tight roll. At the end, moisten the edge, and seal it. Dust it with a little flour and plump it into a nice cylinder. Now, take out some dental floss (you can do this with a knife, but it gets messy), and by wrapping the floss around the center of the roll first, and then "tying" the floss around it, cut the cylinder in half. Cut each piece in half again, and then cut each segment into 3 equal pieces, all using the floss technique. Place rolls, cut side up, in a lightly greased 13x9 baking dish, cover with plastic wrap, and return it to your warm, draft-free spot to rise again for 1 1/2 to 2 hours. Finally, you're ready to bake them after this last rise. I promise it's worth it. Preheat your oven to 350 degrees, remove the plastic wrap from the rolls, and place the dish on the middle rack. Bake until golden brown, about 25-to-30 minutes. Once down, invert them onto a wire rack to cool for 10 minutes. 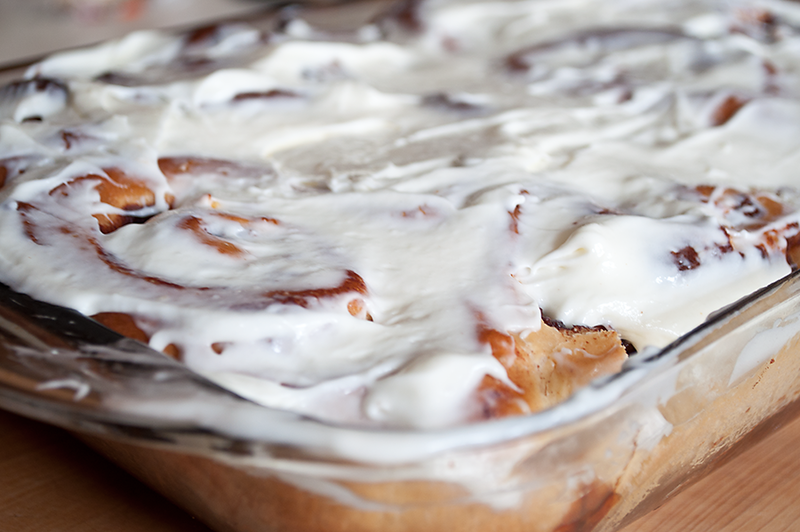 Once, cooled a bit, turn them upright on a serving dish, slather with icing and serve right away! Thankfully, I can still see past my apron. 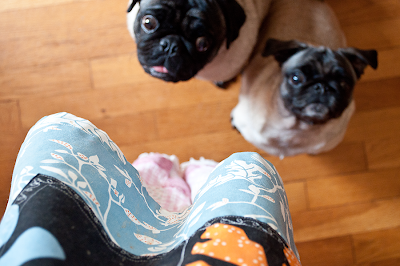 Of course, the pugs are very excited too! Wow. I really have let this go a while. I could say all the normal things. I've been busy. My day job, family, dogs, house, etc, etc have all been too demanding. While all the above are true, it's not the real reason I haven't been writing. I'm not motivated to do so, plain and simple. The real reason I started this a couple of years ago was to share. It wasn't to make money. It wasn't to meet new people. It wasn't to make a name for myself or anything else. It was simply to share good food, good info, and good moments. I let that get away. All of a sudden there was that pressure to post "X" number of times a week, to join this "group of the month", to get to this conference, to tweet non-stop, to not fall off the face of blogging earth. In fact, all of those things probably have been keeping me away. Believe me, I'm not saying any of the above is bad, it's just not working for me. My passion for local food is still extremely strong. However, I'm cooking less extravagant things these days, keeping it simple, hardly worth a post from me to tell you to cook up those greens with some olive oil, garlic, and salt. My passion for keeping my local habits is high, tempered with the moderation I always approach it with. Yes, there's frozen pizza in my freezer. Yes, often we cook that frozen pizza, and pair it with a side of local greens. There's a balance here for everyone, keep finding yours. Don't be dissuaded by blogs, writers, critics, who turn their nose up at anything that's not local, organic, etc, etc, etc. It's not always possible to cook everything from scratch, avoid a drive-through. There will be bloggers who respond and say, "Sure it is". Hats off to them, it's not the life that most people lead or are able to lead. 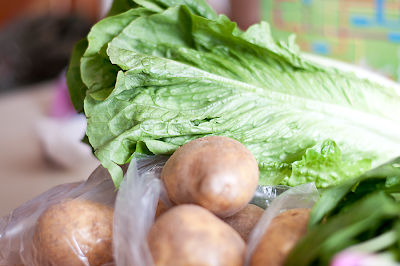 Many of us food types are blessed to live in areas where farm-fresh food is readily available. Others live in parts of the country where Wal-Mart (sadly) is their only choice in a location they can afford to get to. In other words, do what you can. It's never all-or-nothing. Movements very rarely take hold if they are. 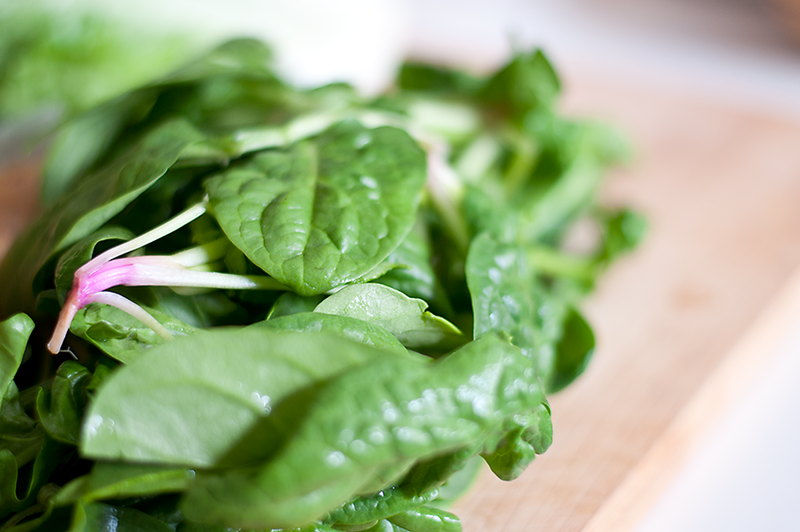 Tackle little bits at a time - local berries first, then maybe greens, and work your way up to meats and grains. Slowly, your habits overall will change entirely. I guess that last tangent was simply because of the "all-or-nothing" approach I see written about out there quite a bit turns me off. It's another reason I stopped writing quite a bit. The judgement level in the food world is high. 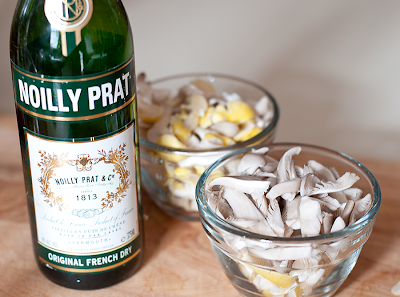 Give people props for cooking, in general, instead of chiding them for using a mix. If someone wants to post more about cupcakes, who CARES if they're "out of vogue". Hell, cupcakes are tasty, it doesn't mater if they're "in-style". This all leads me to our Canada Day cookout and the cake I made. I'm not a huge fan of holiday-themed post, and in this case, the holiday has even passed us by. 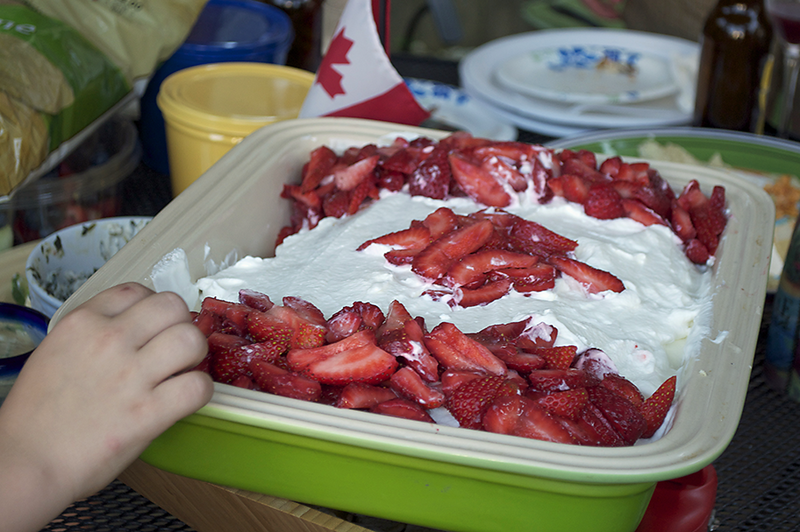 However, this would be great for the 4th of July, or any other time you need a great summery cake. There are versions of this cake ALL OVER the internet that call for store-bought sponge/pound cake, strawberry gelatin mix, and Cool Whip. I thought about taking the easy route for a moment, and couldn't do it. I couldn't use all the artificial ingredients involved. A few years ago, I wouldn't have thought twice. However, baby steps got me to this point, and further. I'm glad I took the "from-scratch" route. It was totally worth it. Honestly, this isn't just for Canada Day, this can be for any summer afternoon. 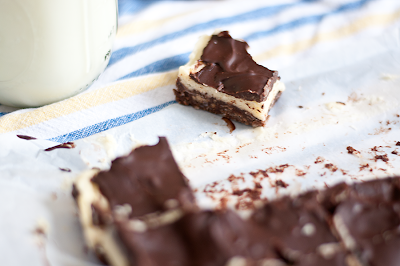 It's not difficult (especially if you have a stand mixer on hand) and it's completely worth the time involved. I think next time I may add some liquor to the sponge cake, I think that might be divine! Take your flour and salt, and sift them together. Return them to the sifter and put it aside. In a large bowl, or in the bowl of a stand mixer (highly recommended), beat egg whites until foamy, sprinkle with your cream of tartar and beat until soft peaks form. Bit by bit - add half of your sugar, beating until stiff glossy peaks form. In another bowl, beat egg yolks and the other half of the sugar until the mixture thickens. Stir in the orange rind and juice into the yolk mixture. Take the yolk mixture and gently fold into egg whites. Sift your flour mix, a third at a time, over the egg mixture, gently folding until well combined. Transfer the batter to an ungreased 13x9 cake pan (I liked mine with parchment to make it easier) and bake in a 350 degree oven for 20-to-25 minutes or until spongy to a light touch. Let cool in pan for 10 minutes, before turning out onto a wire rack to cool completely. If you have the time, wrap and store in fridge for 1 day, or you can use right after it has cooled. It can also be frozen for up to 2 months. Hull and then slice all of the strawberries. In a large bowl, or the bowl of a standing mixer, whip your cream, stir in icing sugar and vanilla. Use a large serrated knife, cut your cake horizontally making two layers. Place one layer, cut side up, on a serving tray, and spread about 1/3 of the whipped cream on top. 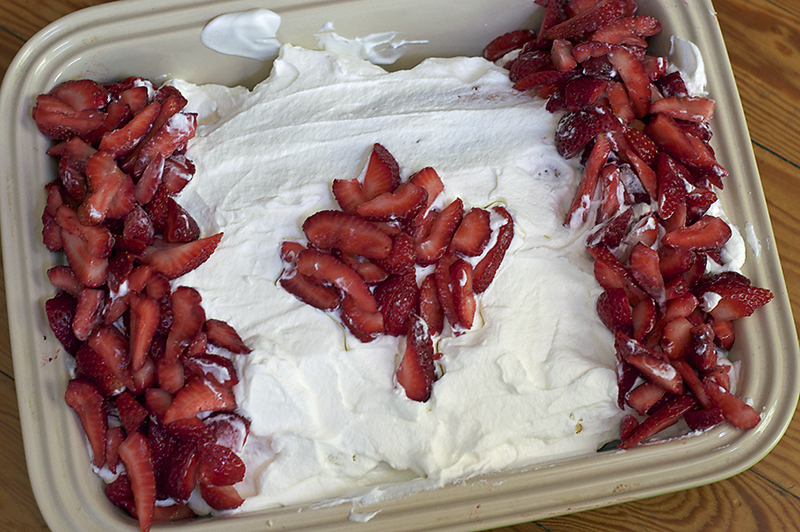 Spread a single layer of strawberries on top of the whipped cream. Place the top layer or your cake, cut side down, over the berries. Spread remaining cream over top and sides. To decorate, spread strawberries in a thick band on either side, and create a maple leaf in the middle with the rest, or simply cover the top in strawberries in whatever kind of decoration you like! There's an interesting discussion underway in the food blogging community today. Are food bloggers "faking it"? Is the surge of hundreds of thousands, actually more likely millions, of food blogs out there "dumbing down" the culinary industry? You're reading this blog, and probably several others, so I'm going to guess you probably don't agree with either sentiment. However, a food journalist put forth an opinion piece, "Faking It", on the IACP web site this week, that puts those ideas out there. The premise is basically this: Major companies in the food industry are paying food bloggers to create recipes with their products, however, there are some food bloggers that do not test the recipes over and over, so therefore, the recipe/creation they put out to the world is an inferior product. The writer also refers to many food bloggers as "hobbyists" or "stay-at-home-moms" with too much time on their hands. Umm, do any of you actually know a stay-at-home-parent (because honestly people, there are stay-at-home-dads too, so get over your sexist stereotypes) that actually has "too much time on their hands"? Also, isn't cooking about experimentation? It's about messing around with a recipe until it's where you want it to be? Does it have to be tested seven which ways to make it "publish-worthy" on the internet? 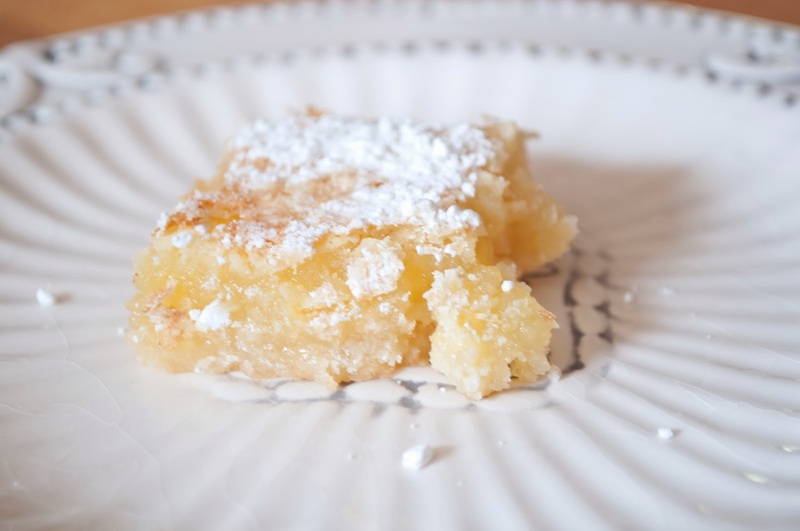 Without food bloggers, you wouldn't have that perfect yellow cake recipe that came from someone's grandmother, instead of the dry, complex one that may have come out of the pages and test kitchens of some high-gloss food publications. Food is NOT reserved for hoity-toity publications, that's where the culinary industry has gone wrong. There is a place for high cuisine. I truly believe it's an art form and it's beautiful, and it should be left to the people who know how to make it happen with grace and style. Most of the food bloggers I know or read, aren't aspiring to high-gloss covers, or high-cuisine. They're focusing on bringing good food back to the tables of whatever country they may be in. They're sharing time-tested family recipes, creations that worked in their kitchens, and information that has made cooking accessible again in their households. Food blogging is not "dumbing down" the culinary industry. Instead, this movement is making cooking "real", "down-to-earth", and bringing people back into the fold of things like from-scratch baking, canning, and preserving. You all know, I don't write this blog for money. I do get compensated from time to time for certain posts. This isn't my career, it's a love I have for food and sharing it with others. In the end, that's how almost all food blogs begin, with a love for cooking or baking. Let's all celebrate that cooking and baking is making a comeback among the masses again, instead of tearing down the people that are working so hard to get it there. 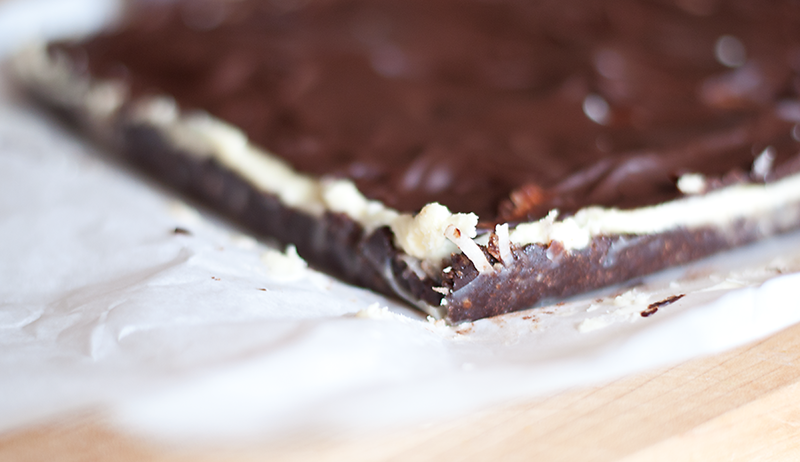 Discuss amongst yourselves, while I offer up some nanaimo bars while you chat. Yes, they've been all over the internet already. No, they're not my own creation, but a mish-mash of other people's creations. Honestly, I never even knew what they were until I first visited the man who would become my husband in Vancouver. His family had made them for years, and it was love at first bite. I now make them whenever possible. Enjoy. Note - traditionally you add a 1/2 cup of chopped almonds or nuts to the bottom layer, I do not, feel free to add, however. Take an 8x8 square baking pan, line with parchment (or wax) paper, leaving plenty of overhang so you can lift the bars out of the pan later. Melt 1/2 cup butter, sugar, and cocoa in a double boiler. Add egg and stir until mixture thickens (also making sure the egg doesn't cook either), then add vanilla extract. Remove from heat and fold in crumbs, coconut (and nuts if using, see header above). Press into your lined baking pan and place in fridge to cool while you make the second layer. Using a stand mixer or a hand mixer, cream together 1/2 cup of butter, your milk, pudding powder, and icing sugar until light and fluffy. 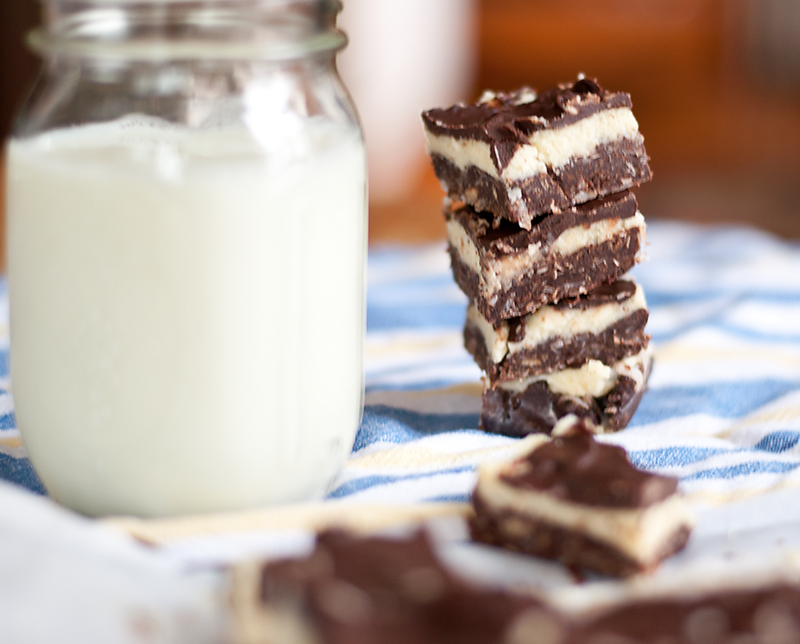 Spread over the bottom layer of the bars and place back in the fridge. Melt chocolate and butter in a double boiler until melted together. Allow to cool a touch, but when it's still liquid, pour over other layers, and then place in the fridge to chill until the top layer is hardened. Lift parchment out of baking pan, and cut into small squares and enjoy! Nothing makes this blogger happier than good local people seeing good things happen with their amazing local businesses. Enter Shady Oaks Organics of Newburyport. You may have seen their name in several restaurants from Newburyport, to Portsmouth, to Boston. 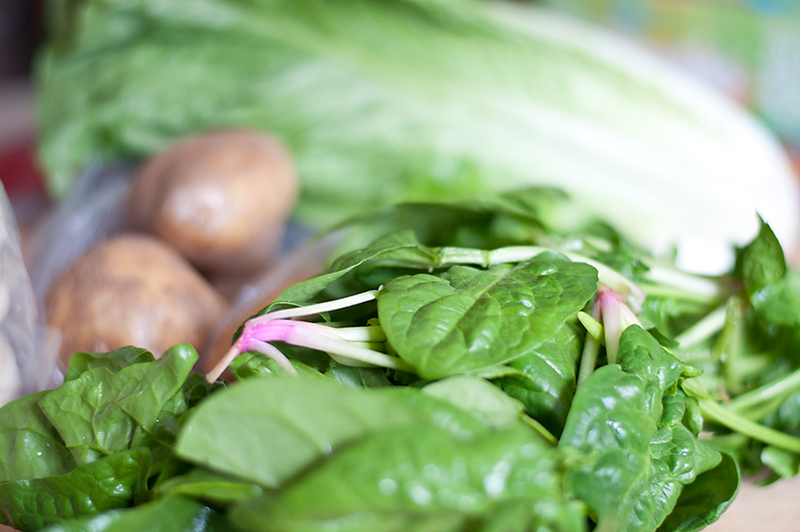 Chefs locally are picking up on their fresh, beautiful products and serving them up for you. Here in Newburyport, both Enzo and Ceia both use Shady Oaks mushrooms in their dishes and proudly display them on their menus. By the way, if you haven't tried either of those restaurants, get up, and go, I'm serious. However, we're talking mushrooms today. This writer will admit she has never had a love affair with fungi. She also has never tried mushrooms as wonderful as these. 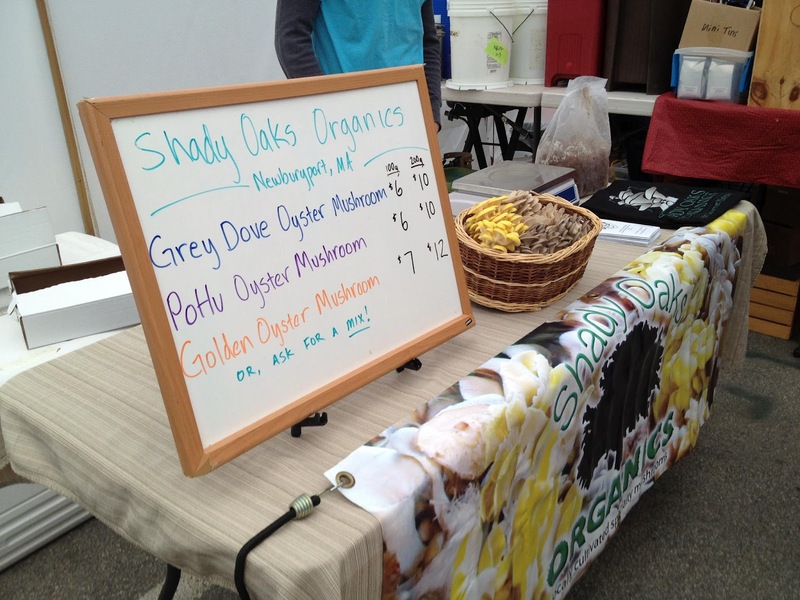 From golden oyster, to grey dove, to shitake - Shady Oaks cultivates several varieties from organic straw in their Newburyport greenhouse. These are perfect specimens, as beautiful to behold as they are to eat. The company was started by a pair of locals, Nate Seyler and Devin Stehlin, who realized the market for such a product in New England was lacking, and they could fill the void. They run the business along with Leif Johnson, traveling to farmers' markets throughout the region, and making deliveries to various local restaurants, and stores. You can find them at the Newburyport Farmers' Market, if you're in the area. The trio just received kudos and first place at the 2012 North of Boston Business Plan Competition at the Enterprise Center at Salem State University. They're looking to expand, and bring more of local-loving folks like myself more amazing mushroom selection. To be fair, I have to admit that Seyler is friend of myself and the husband, but the dedication that he, and his other partners bring to the local food table is nothing short of extraordinary. They have a commitment to this city and this region that gets them a gold star in my book. 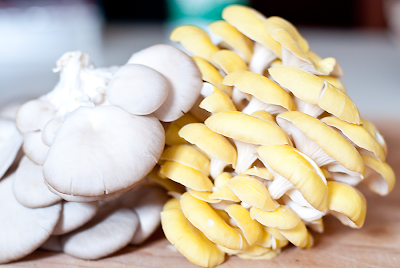 The husband and I picked up several varieties of their mushrooms at the Newburyport Farmers Market last weekend. The husband would just eat them straight, I like them with a little finesse. 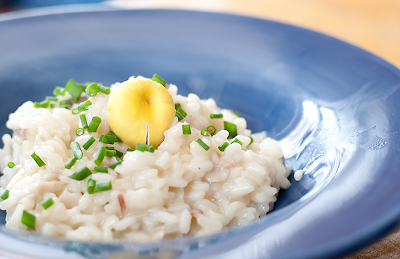 I've never made a mushroom risotto, so I went researching for a simple, straight forward recipe that would allow the mushrooms to shine. There are many out there, and too many have ingredients such as pancetta or bacon that I felt would compete with these superior fungi. Simply Recipes came to my rescue with the simple, yet wonderfully flavorful version you will find below. You need to know more about Shady Oaks Organics, by the way. Their story and process is fascinating. Start with this recent article in the Newburyport Daily News, try their website, and don't forget to give them a "like" over on Facebook. Support local people doing great things, your community is stronger for it. In a medium saucepan, bring your stock JUST to a simmer. You don't want it boil. Take a dutch oven, and melt the 3 tablespoons butter over medium high heat. Now, add in your rice, allow to toast for a minute or two or until the rice becomes translucent. 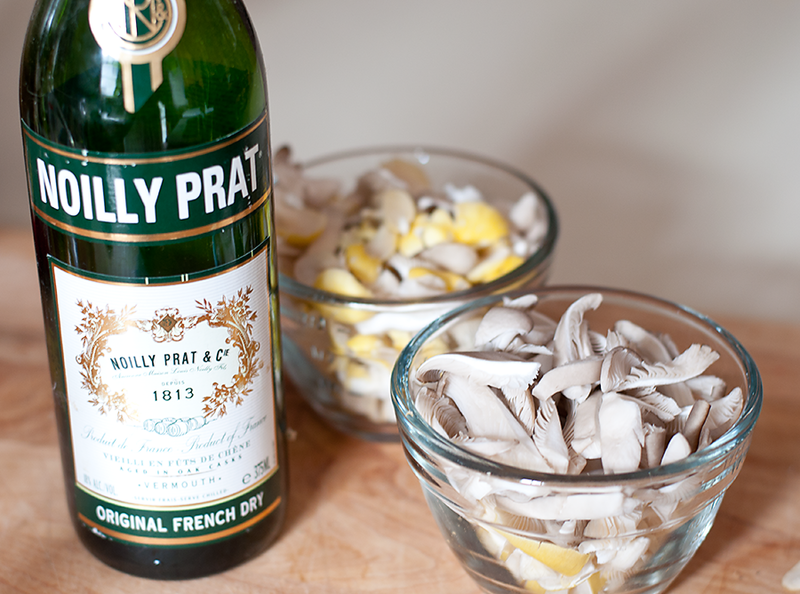 At this point, dump in your vermouth, bring the mixture to a boil and reduce the liquid by half. This should take about 3-4 minutes. Now you're ready to get that risotto nice and creamy - reduce the heat to medium, then add the stock to the rice mixture a half cup at a time. 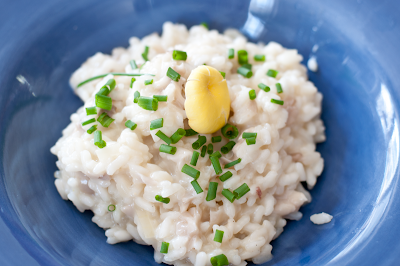 All along the way, you're going to continuously stir the rice, that's what makes it creamy. You want to wait until the stock is nearly completely absorbed before adding your next batch. Continue doing this until the rice is cooked, but slightly al dente. All together this takes about 25-30 minutes. Once you've achieved the desired consistency, stir in your parmesan cheese, the last tablespoon of butter, and add salt and pepper to taste. Serve garnished with the chives. It's Sunday. 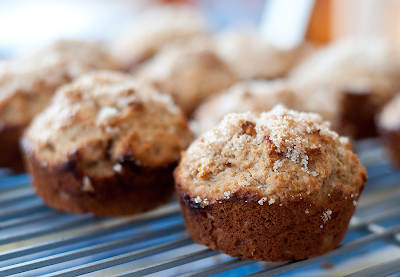 Sunday is a day for strolls, and muffins. I admit that after last weekends 5-mile jaunt, I was ready for it again. However, Mother Nature was not quite ready for me. After a week of 70+ degree temperatures in New England, March became March. It's cold, rainy, and barely hitting 50 degrees today. Therefore my "Sunday Stroll" this week included a walk to and from my mom's car, to Ten Center Street, in Newburyport, Ma., and what you see below. I love a Bloody Mary on a Sunday. On cold, early spring days like this one, you need a hug. A warm, hearty, toast-your-belly, type of fare that delivers on the comfort you're craving. 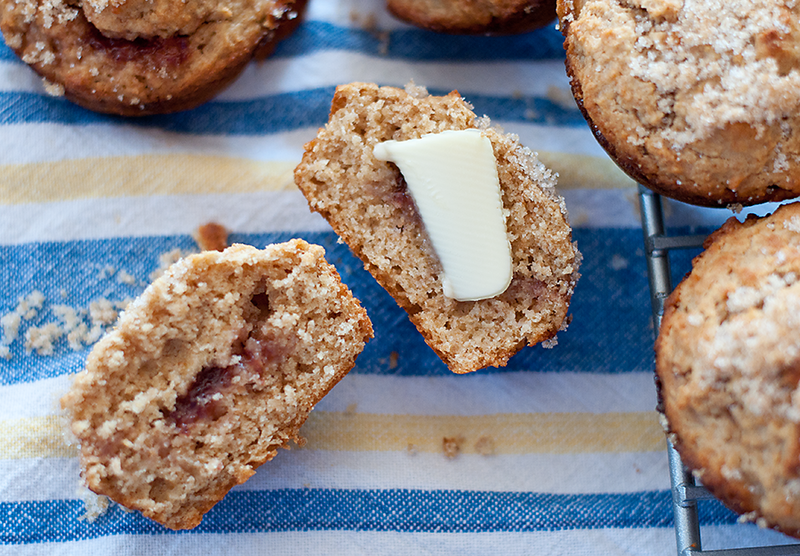 These muffins are just that. They're substantial with the sweet surprise of jam in the middle. This particular Sunday, they're filled with Strawberry Jam. I made it early last summer. It was my first real foray into canning. I'm telling you, on a raw March day, the taste of a June strawberry is absolutely divine. It tides me over until I'm back out strawberry picking again. You can fill them with whatever kind of jam you have on hand. The whole wheat gives them a nutty flavor, which by all means, if it's not your thing, feel free to use regular old all-purpose. In one bowl combine whole wheat flour, baking powder, baking soda, salt and sugar. Whisk to combine. In another bowl, lightly beat the two eggs, and add canola oil, honey, buttermilk and milk and whisk to combine. Add wet ingredients to dry ingredients and stir until the mixture resembles a thicker batter. 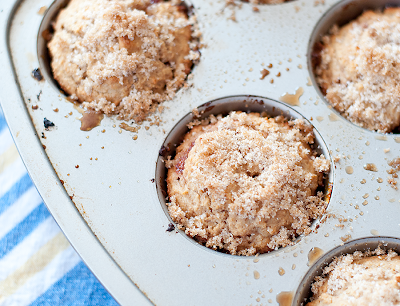 Grease a muffin pan (normal sized) and fill each tin up a little less than halfway. 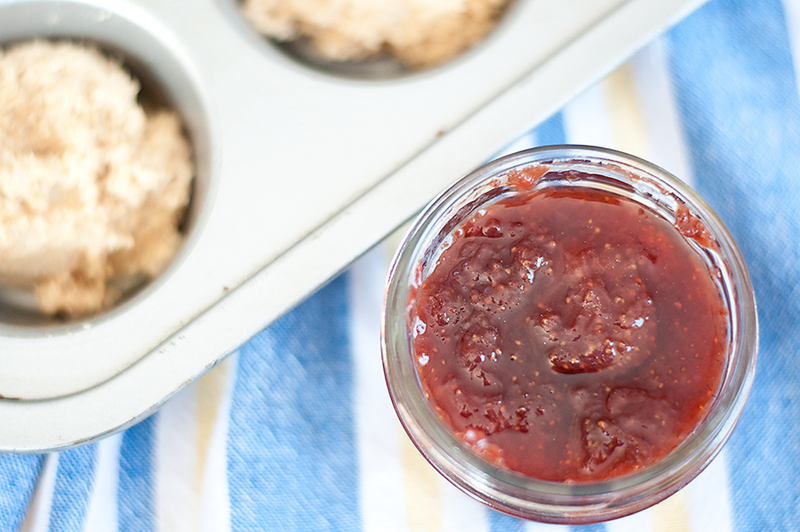 Grab your jam and put a dollop of it on the batter in each tin. Divide the rest of the batter between the 12 tins, covering the jam. Pop into your preheated oven for 10 minutes. 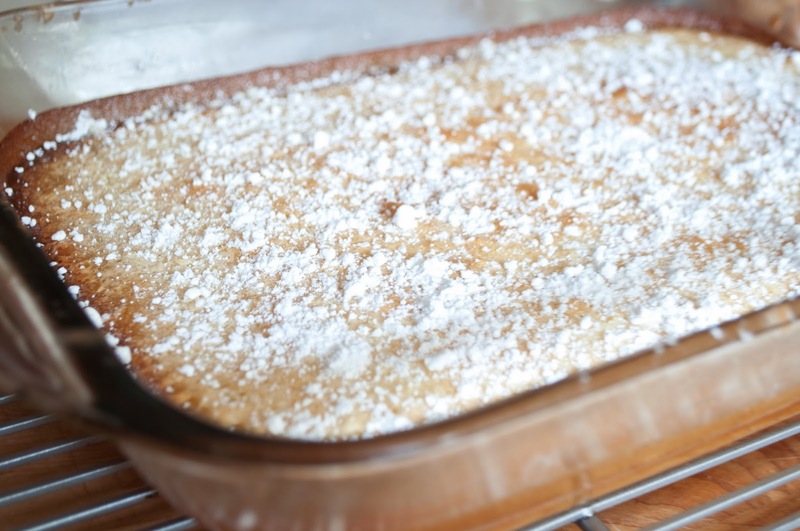 While they're in the oven, combine sugar and brown sugar in a little bowl and whisk to combine. After 10 minutes of baking, sprinkle the muffins with the sugar mixture. Bake for another 5 minutes or until a toothpick inserted in the center of each comes out clean. Take out of the oven, allow to cool in the pan on wire rack for 5-10 minutes. After that time, pop out of the pan and serve warm with butter and extra jam.